The War of the Tablets is back. In Part I, we have talked about the big daddies of the Tablet market; in Part II, we have mentioned about the game-changers. But in the concluding part, we will cover the underdogs of the Tablet market. These Tablet devices may not be as popular as the big players or the game-changers, but they do pack a punch, nonetheless. We have also added two new sections in the feature which talk about the news doing the rounds these days and the cheap alternatives which are available in the market. Splash Telecom, a Chinese mobile handset manufacturer has also come out with a Tablet in India called Zinglife E-Pad ZL101. The company is further planning to launch two more Tablets by August end. The current one has a 10.1 inch TFT (1024x600 pixel resolution) touchscreen with 3D Accelerator and runs on the Android 2.2 (Froyo) operating system. It has a 1.0 GHz processor (ARM11), 512 MB of RAM and 4 GB of internal memory which can be further extended up to 32 GB with a MicroSD card. Additionally, the Tablet supports 3G data cards, has a front camera for video chat and has a USB 2.0 port, a Mini-USB port and an HDMI port for LCD connectivity. It also comes with an Office Suite which allows viewing and editing Word, Excel, PowerPoint & PDF files. The Tablet is currently available on eBay for a discounted price of Rs 12,499 and will come with a free carry case. The offer is valid till August 14, 2011. Micro Star International (MSI), a Taiwan-based electronics company known for its motherboards and VGA cards, will launch 2 new Tablets in India called the WindPad Enjoy 7 and 10. The availability and price of the Tablet have not been disclosed yet. MSI India General Manager Eric Kuo said, "We are fairly new in the notebook category and we are working on increasing our brand recall in that segment. We don't want to compete only on the basis of price, but we also want to be known for quality and technology (of product). We are also aggressively looking to expand our operations in India. By year-end, we are looking at doubling our headcount and setting up more offices. We will also strengthen our distribution channels for all products." As their names indicate, WindPad Enjoy 10 will have a 10 inch display (1024x768 pixel resolution) while the WindPad Enjoy 7 will have a 7 inch display (800x480 pixel resolution). Each device has a 1.2 GHz Arm Cortex 8 processor, 512 MB of RAM and 4 GB of internal storage, expandable up to 32 GB. Both run on Android 2.3 (Gingerbread) operating system (which is bad, since Ice Cream Sandwich is the next big thing and Honeycomb is already available). Each features a 2 MP camera with video recording at 720p and a front-facing camera for video-calling. These can be priced between Rs 10,000 and Rs 20,000. Toshiba has also come up with its own Android-powered Tablet called Thrive. As of now, it is only available in the USA and through Amazon. Thrive has a 10 inch, IPS technology-based LCD display (1280x800 pixel resolution) and has a dual core 1 Ghz Nvidia Tegra 2 system on a chip. It has the Android 3.1 (Honeycomb) operating system, 1 GB DDR2 memory and is available in 8, 16 and 32 GB storage capacity. It also features 5 MP auto-focus camera and 2 MP front-facing camera for video chat, and the company claims a battery life of 7-8 hours. The Tablet is available in the USA for $430 (around Rs 19,350) for 8 GB, $480 (around Rs 21,600) for 16 GB and $580 (around Rs 26,100) for the 32 GB version. The Indian launch date is not yet confirmed. Although it has been recently launched, things are not looking very good for Thrive as power-related issues are already making the rounds. Viewsonic is also launching two new tablets that include a 7 inch Android based tablet and a 10 inch tablet with both Windows and Android operating system. The company is also planning to launch more tablets in the coming months. The 7 inch Tablet will have the Android 2.2 (Froyo) OS and will run on a 600 MHz processor. It will also feature 3 MP camera, a front-facing VGA camera and 3G facilities (through a dongle). The battery will support four hours of heavy-duty usage. The 10.1 inch Tablet with capacitive touch display (1024x600 pixel resolution) and LED backlight will have a dual boot operating system (will run both on Android 2.2 Froyo and Windows 7 Premium OS) and will run on an Intel Pine Trail N455 1.66 GHz processor (latest version of Intel's Atom processor family). It will have DDR3 2 GB RAM and up to 32 GB of storage space. It will have 1.3 MP camera and as an added advantage, the WiFi of this Tablet will be capable of transferring data to the projector that supports data streaming over the WiFi. Additionally, it has 2 USB ports, a mini VGA port, a MicroSD slot and 3G. The Tablet weighs 907 gm and will provide a battery life of four hours. The 7 inch device is nothing great but the 10 inch powerhouse can give the bigger players a run for their money. The only drawback of this Tablet is the short battery life, which means continuous charging. The exact prices are not yet available, but it can be around Rs 17,000 for the 7 inch Tablet while the price of the 10 inch Tablet can exceed Rs 30,000. Enso's Zen pad: An Android Tablet priced at around Rs 14,000. Binatone Homesurf: Another Android Tablet priced at Rs 8,995. Accord @Pad: Features Android OS and priced at Rs 8,999 (manufactured in India). Wespro Epad: Android OS, priced at Rs 7,999. Wespro 8 inch PC Tablet 886 with 3G is available at a discounted price of Rs 6,999. Wespro 7 inch PC Tablet 786 with 3G costs Rs 5,999. Videocon is planning to launch a 7 inch Tablet early next month. Panasonic is launching an Android-based Tablet device dubbed the Toughbook Tablet. Asus Tech's Eee Pad Slider Tablet will come to India by Q4 2011. Apple iPad 3 can be released in October, 2011. Amazon will debut two Android-based Kindle Tablets this year â€“ a 7-inch device dubbed Coyote and a 10-inch one dubbed Hollywood. Lenovo is coming up with its tablet this year called Lenovo Le Pad. Dell is set to unveil another Windows 7-based Tablet codenamed Peju. GFive will launch 7 and 10 inch Tablets in August which will cost you less that Rs 10,000. Spice will launch a 7 inch Android Tablet called MI 720 in August, 2011, priced around Rs 20,000. Huawei will launch a 7 inch Tablet called MediaPad, which will be the first Android 3.2 Tablet and will be priced at Rs 25,000. 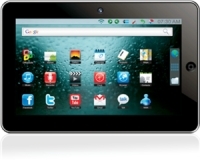 Cisco Cius Tablet, aimed at enterprise users, will start shipping its devices at the end of this month. The 7 inch Android tablet will be priced at around Rs 32,000. The upcoming LG Optimus Pad Tablet (with an 8.9 inch multi-touch display) running on the Android OS (Honeycomb) will have a 3D-capable display and will be priced around Rs 30,000. Now that you know almost everything about the War of the Tablets, you will be able to choose the one that fits your budget and meets your specific needs. However, we have not mentioned the Indian babies in this feature due to the size constraint, but will come out with a separate article dedicated to those. Finally, the pieces are set and the players are ready. Strategies have been made and the warriors have worked hard to outshine each other in terms of features and utilities. Everyone will fight, but only some will win. But there's no time to assume things nowâ€¦ Let the War begin!